Blue Rock Construction, Inc. > Blue Rock Project Profiles > Industrial > Amazon.com, Inc.
Blue Rock Construction added to Amazon.com’s growing list of fulfillment centers in the United States after producing a 750,000-square-foot warehouse distribution facility in Carlisle, PA. 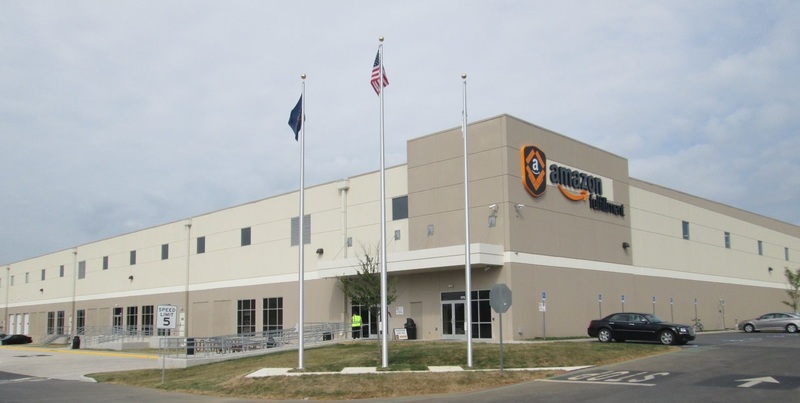 The fast-track, tenant improvement/reconfiguration warehouse, which was completed within 20 weeks, gives Amazon more than 50 fulfillment centers in the U.S., including two in Carlisle, Pa. The new location will continue to help meet Amazon.com’s increased customer demand. Along with a 30,000-square-foot office fit out, other warehouse services included rooftop air conditioning, security stations, locker rooms, offices, and conference rooms. In addition, the scope of the work consisted of a trucker’s lounge, remote restrooms, scrubber dump, plus mechanical, electrical and plumbing to support Amazon.com equipment for shipping/receiving operations. Blue Rock also coordinated and assisted with racking conveyor and Amazon equipment installation. Amazon.com, a Fortune 500 company based in Seattle, WA, is the global leader in e-commerce. Since Jeff Bezos started Amazon in 1995, they have significantly expanded product offerings, international sites, and worldwide network of fulfillment and customer service centers. Today, Amazon offers everything from books and electronics to tennis rackets and diamond jewelry. Amazon operate sites in Canada, China, France, Germany, Italy, Japan, Spain and United Kingdom and maintain dozens of fulfillment centers around the world.